Each year, the club takes a field trip in May and has only a very short meeting. The destination is always a well guarded secret and a sweet surprise for members! 2016 Spring Field Trip was held on May 17 - 18, 2016 with an overnight trip to Garvan Woodland Gardens in Hot Springs, Arkansas. There website is: https://www.garvangardens.org/. The bus departed Riordan Hall at 10 am on May 17th, stopping for a fast food lunch, and arriving at Comfort Suites Hotel in Hot Springs by 3 pm. After receiving complimentary bags from the visitor's bureau & checking into our rooms, we had dinner at Fisherman's Wharf Restaurant. 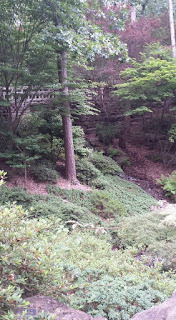 After breakfast in the hotel & checking out of our rooms, we headed for Garvan Woodland Gardens where we had a docent led 45 minute guided tour and plenty of time to wander around the gardens on our own. After lunch at the Chipmunk Cafe, we boarded the bus at 1 pm for the trip home. Fun was had by all! 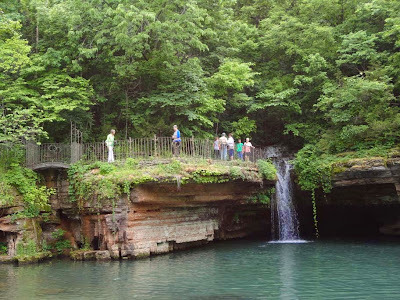 On May 28th, 2014, club members traveled via charter bus to the Dogwood Canyon Park in Missouri. At the park members boarded a covered tram that took them on a tour of the park. The tour included the wedding chapel, trout ponds, numerous waterfalls, streams, covered bridges, and a variety of animals. The picnic lunch had two sandwich choices which were Ozark ham with Swiss Cheese or Slow Roasted Turkey with Vermont Cheddar. Both came with other goodies. Another successful trip and a fun day for club members. May 22, Club members met at The Botanical Garden of the Ozarks and enjoyed lunch and a tour of the gardens. Field Trip to Learning Fields At Chaffee located at Fort Smith, AR. The Trip to Learning Fields was canceled due to a massive tornado that hit Joplin, MO. The bus we had chartered was coming from Joplin and the company canceled. The 2010 field trip found the club making its way to Bentonville to visit Compton Garden and the Crystal Bridges Construction Overlook. After a tasty lunch, we were treated to four knowledgeable speakers. Jamie McGaugh told us about the construction and how Crystal Bridges will fit into the natural setting. Erin Jones talked about the layout of the galleries and the art. Scott Eccleston shared information on using native plants and rock on the grounds and about developing 4 miles of trails through the 100 acres of the Crystal Bridges property. Corrin Troutman enlightened us about Compton Garden's preservation efforts and all the different areas that make up the garden. Then Corrin Troutman and Scott Eccleston treated some of us to a tour of Compton Garden while other members were accompanied by Erin Jones to the Overlook. Later Corrin's group proceeded to the overlook on our own and were amazed at the progress on the massive construction. We can't wait for the Museum to open. A great time was had by all!! !